May 24 2014 - Tied for first place going into the final leg of The Atlantic Cup and leading the race. Mike Hennessy Class40 Dragon was flying out of Newport Harbour, spinnaker up and doing 12 knots when Dragon smashed into a rock. Emma Creighton, their bowman, was launched into the water, but was quickly retrieved and all of the crew escaped injury. The team motored back to the Newport Shipyard to assess the damage. Upon pulling the boat out of the water they discovered major damage to the keel box. May 27 - The boat's designer, Merf Owen, had looked her over. Stu Wiley of alFresco Composites and Brit Colombo of Carbon Ocean Yachts (both great builders) had also checked Dragon out. Only in Newport.....” Mike Hennessey. 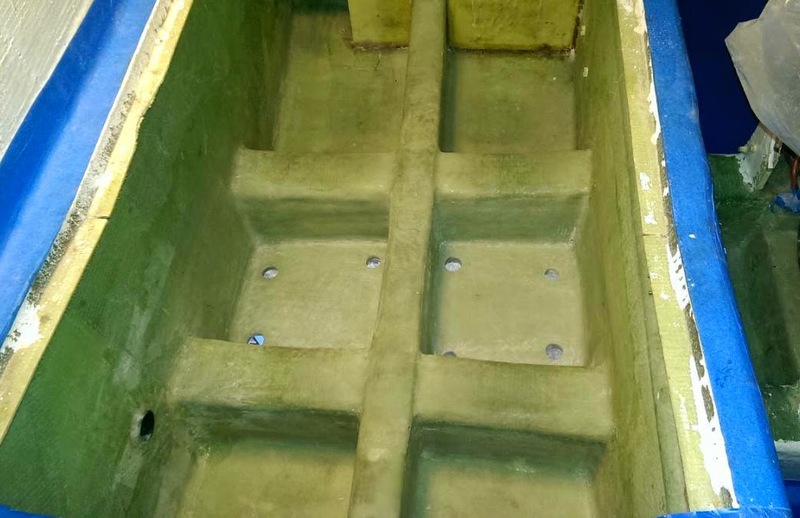 The initial inspection showed there was damage to the keel grid inside the boat and the faring all around the outside was broken. June 4 - De-rigged, Dragon was hauled out into a boat shed at Newport Shipyard to await survey tests and insurance assessement. – After further assessment additional problems were also discovered including damage to the fin, cracks to the hull, bent keel bolt. Carbon Ocean Yachts were tasked to get Dragon back into offshore racing condition by 11 August. Using the facilities at Newport Shipyard, Carbon Ocean Yachts set about rebuilding Dragon. On further inspection other areas of concern included voids to the bulb and areas of de-lamination. August 9 – Despite additional work required on top of the damage report from the collision. Dragon was relaunched 48 hours earlier than scheduled for the boat to be re-wired and for Mike Hennessey to trial the boat prior the the Ida Lewis Distance Race. “Newport has some amazing talent available when it comes to boats, and shortly after the hull survey was complete Britt and Toby of Carbon Ocean Yachts had their gear on site and their grinders going. Working long hours and flat out. Two months and two weeks since her bulb kissed that rock, she touches water again. Dragon returns to her element, resurrected. ” - Mike Hennessey.